16 Ounce Travel Cup with Colorful Lid and Straw - Clear Plastic Cup with Colorful Lid and Coordinating Straw. 2.5" across bottom, 6.25" tall (without straw) and 4" across the top. 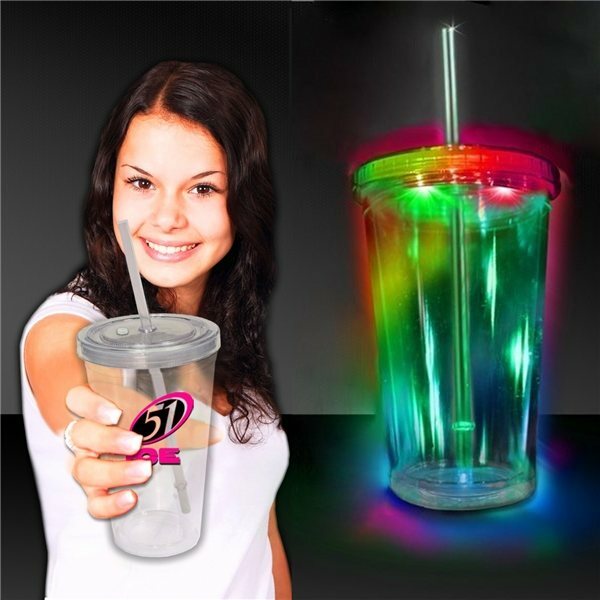 Our double walled clear plastic light up cup comes with your choice of colorful lid and matching straw. The lid features built in LEDs in red, blue and green and 8 different light functions. 3 AG 13 Batteries are included and installed and can be replaced.